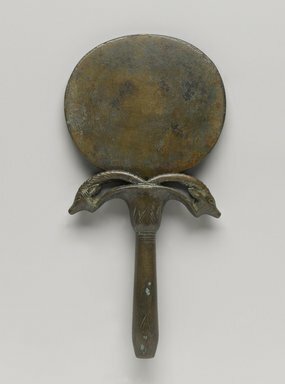 Bronze mirror in two parts; papyriform handle ends in an umbel topped with two ibex heads, facing out; their horns meet in the center. A rectangular socket in the handle received the trapezoidal tenon from the disk itself which is ellipsoid in shape. Condition: Scratched and in several areas on both handle and disk with bronze disease.